Boy Scout Troop 275 is chartered by North Plains Christian Church and currently holds Troop Meetings on Mondays at 7pm. We welcome boys, ages 11 to 17, who live in or near the community of North Plains. 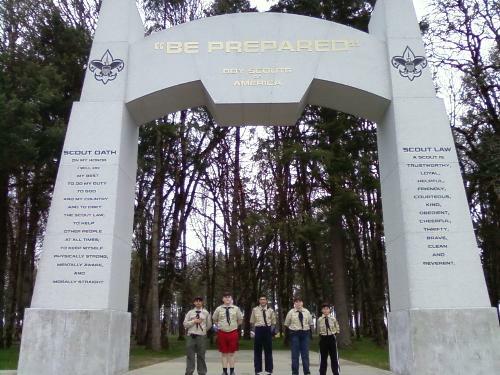 Our Troop was chartered March 15th, 2012, and currently has two Patrols, one for younger Scouts and one for Scouts 13 and older. Our enrollment is growing steadily due to the support and recruiting of our Scouts. They have plan all variety of outdoor activities, including fishing, camping, hiking, horseback riding, and commmunity service. Our Troop maintains a close relationship with Pack 175, chartered by the Knights of Pythias in North Plains. Please contact Darrel Smith at (503) 648-1488 for answers to any questions you may have. 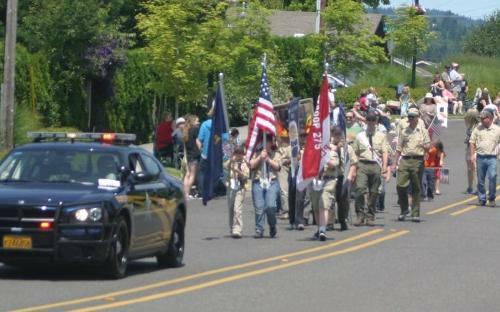 Troop 275 was honored to carry the flags of our nation, our state, and our Troop at the front of the North Plains 4th of July parade in 2012! The Evergreen Air and Space Museum is already one of our favorite destinations. We've earned the Robotics and Space Exploration merit badges there, and enjoyed private tours of the museum after hours.